In the meantime, Command Posts put up some interesting pictures from military Christmases past, including the one below (which shows Christmas dinner before members of H Company, 2nd Cavalry out of Ft. Wingate sit down to eat, 1895). The post is worth checking out! 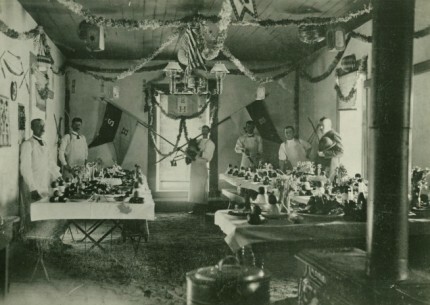 A Christmas feast prepared for members of "H" Company , 2nd Cavalry stationed at Fort Wingate, New Mexico in 1895. Photo: USAMHI. Caption: U.S. Army. This entry was posted on Sunday, December 25th, 2011 at 19:28	and is filed under Military. You can follow any responses to this entry through the RSS 2.0 feed. Both comments and pings are currently closed.